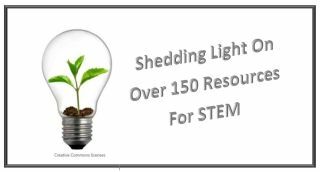 Welcome to another STEM related series of four posts bringing you over 150 amazing resources. I hope you enjoyed my thoughts of STEM being a Verb in the last post. In this series of posts my goal is to provide you with practical resources in each of the STEM areas. This post is dedicated to Science. Since there are a gold mine of resources below I will keep my comments short. While STEM incorporates Science and so much more I thought you might enjoy looking at some the best sites I could find in the area of Science. As you look through over 40 possibilities be sure to take some notes. It really is OK to get lost in one or two and leave the rest for later. Please take a moment to share this post with fellow educators with a tweet. Enjoy your journey and please let me know others I should add. Science Net Links – A premiere site for STEM resources. What a wonderful place for educators to find quality teaching tools, interactive, podcasts, and hands-on activities, and best of all… it’s free! Arkive – Explore this amazing online encyclopedia of life. It will engage your students while fitting into any project. Frontiers Science For Kids – Not only are these articles for kids… they are written by kids. Perhaps your students could be the next contributor. National Science Foundation – Check out this diverse collection of lessons and web resources for classroom teachers. Materials are arranged by subject area to help teachers quickly find resources in any interest area. Journey North – It started with the Monarch Butterfly and is now so much more. Track migration and seasons with students across the country. Globe – Program is an international science and education program that provides students and the public worldwide with the opportunity to participate in data collection and the scientific process, and contribute meaningfully to our understanding of the Earth system and global environment. PHet – These are interactive simulations from the University of Colorado in Boulder. They include a large selection of simulations in biology, earth science, physics, chemistry, and math. On a Teacher Page, you can browse for teacher created activities that go with a simulation. Best of all, you can download simulations to a local computer if you do not wish to rely on an internet connection. Learning Reviews Science – More than 500 free interactive science websites and apps. Kids and high school students can choose from games, lessons, experiments and projects. They include topics in earth sciences, animal, human and plant biology, astronomy, and high school physics — even computer science and engineering. NSDL – The National Science Digital Library has some outstanding resources that include numerous links to some great STEM programs and organizations. Understanding Science… How Science Really Works – Discover this assembly of resources to help educators increase student understanding of nature and the process of science. There is a collection of wonderful lesson plans, teaching tips, and pedagogical strategies You can also visit a Teacher’s Lounge or explore the all-level resources. It is fun to discover how science really works. New York Hall of Science – Wonderful site presents 450 exhibits, demonstrations, workshops and participatory activities that explain science, technology, engineering, and math. CK12 – Starting with their amazing free digital books is really just a start. Continue to explore all of the simulations, formative assessments, and lessons. Nova Science Education – NOVA is the most-watched prime time science series on American television, reaching an average of five million viewers weekly. Smithsonian Science Education Center – This website of the Smithsonian Science Education Center (SSEC), the only unit at the Smithsonian Institution that is solely dedicated to formal preK-12 science education reform. California Academy of Science – The California Academy of Sciences is a renowned scientific and educational institution dedicated to exploring, explaining, and sustaining life on Earth. Science News For Kids – Wonderful collection of the latest news written for kids that will fit into any project. Science Friday – Covering the outer reaches of space to the tiniest microbes in our bodies, Science Friday is the source for entertaining and educational stories about science, technology, and other cool stuff. HHMI BioInteractive – It really is through innovative science education programs that HHMI seeks to strengthen education in biology,and related sciences from elementary school to graduate studies and beyond. Educators will find a wealth of information and resources including sources from Biology, Chemistry, Physiology, and even 3D Printing. There is something for just about any STEM classroom that is ready to engage students. Project Noah – Visit tool to explore and document wildlife and a platform to harness the power of citizen scientists everywhere. Click To Science –The basic foundation of Click2Science is their 20 Skills to Make STEM Click. These are skills they claim are necessary to implement science effectively in an out-of-school time settings. Click2Science really is an indispensable resource for staff working directly with youth and for coaches and trainers working with staff. It also a resource that classroom teachers may just want to get some STEM ideas from. National Geographic For Kids – Nat Geo Kids inspires young adventurers to explore the world through award-winning magazines, books, apps, games, toys, videos, events, and this website. Nova Labs – Discover this site that provides real labs, real data, and you. You will feel the engagement. Learn Genetics – Visit this site from the University of Utah. You will find that there is more then genetics here. MIT K12 – This site was built around a simple idea: K12 educators and MIT should be working together to make movies for K12 students. Educators submit ideas for experiments or demonstrations they would like to see an MIT student perform and explain in a short video. MIT students can then “check out” these assignments or they can come up with their own ideas and check them out themselves. The result is an amazing K12 STEM video online to be used in the classroom. Concord Consortium – You can bring out the inner scientist in all your students with our scientifically accurate models and activities. Search at the site or head over to their NGSS Pathfinder! NASA Wavelength – Now is the time for you to explore NASA Wavelength, an initiative dedicated to providing education a digital collection of Earth and space science resources for educators of all levels. The incredible resources at Nasa Wave Length were developed through funding of the NASA Science Mission Directorate (SMD). You will find that all the resources have undergone a rigorous peer-review process. The Big History Project – Discover this world of history so full of science information. It is multimedia at its best! NSTA – I cannot leave out the amazing resources at the National Science Teachers Association. I especially like their resource page and their amazing Feebies Page. Institute of Physics – Check out this amazing resource page that will provide many ideas on physics. National Geographic Explorer – Bring National Geographic to your classroom through lesson plans, maps, and reference resources. SAS Curriculum Pathways Science – Check out these amazing lessons, inter-actives, and assessments that are free and engaging. OER Commons Science – Check out this great resource that connects to hundreds of other amazing free resources. Check out all the science areas. Science Snacks – Are your students hungry for fresh, exciting science activities based in amazing phenomena? Science Snacks are hands-on, teacher-tested, and use cheap, available materials. They are sure to satisfy your students’ curiosity without ever getting full. Scientix – Visit a page that promotes and supports a Europe-wide collaboration among STEM (science, technology, engineering and math) teachers, education researchers, policymakers and other STEM education professionals. Make sure you explore this resource page. science research adapted for students. Big Picture Science – Browse over 1,200 resources by filtering for topic, education level or type. If you’re looking for something specific, you can use the search field at the top of the page. Smithsonian Tween Review – Check out this e-magazine resource filled with amazing science based articles for tweens and teens. You will also find resources and lessons. Best of all the same article can be transformed by grade level or lexile. PBS Learning Media – While this link goes to videos in all areas, be sure to open up the Science link to dig deeper in science only subjects. Learning Reviews 100 Science Fair Projects – Help your students kick-start their science fair project with one of these great options! Here is your connection to some of the best free project plans available. Science Hub – Here are hundreds of free detailed plans for projects for elementary, middle and high school students. The plans are sorted by discipline – astronomy and space, chemistry, engineering and architecture, physics, technology, and earth, life sciences, physical sciences, and… well, “other” for no clear fit. PTA Web Cams – If you cannot be there then go there virtually. Science is about observation. What type of observation activity can be part of your science class. Check out these possibilities.